Theranostic nanoparticles are emerging technology for imaging and drug delivery. The focus of this talk is on theranostic fluorous nanocolloids based on triphasic nanoemulsion formulations (Scheme 1), first reported by our laboratory in 2012, and since expanded into threranostic nanoformulation platform applicable for cancer, inflammation and pain imaging and treatment. Earlier reported perfluorocarbon nanoemulsions were two-phase systems with PFC oil as an internal phase and where the surfactant layer incorporated a drug, dye and/or a targeting agent. (Aikers et al, Nanomedicine 2010, Soman et al, Nano Lett. 2008) Our approach was to introduce a “third” phase – organic (hydrocarbon oil) into the PFC nanoemulsion while maintaining small droplet size (85-140 nm) and polydispersity (PDI<0.15). (O’Hanlon et al, JFluoChem 2012, Mountain et al, JFluo Chem 2014, Patel et al, PLOS One 2013, Janjic et al, Biomaterials 2014) These nanoemulsions are triphasic because they are constituted from three immiscible liquids: PFC (fluorous phase), hydrocarbon (organic phase) and water (aqueous phase). Representative results from in vitro and in vivo studies in multiple animal models will be presented to demonstrate broad utility of triphasic nanoemulsions as theranostic nanomedicines for inflammatory diseases, injury and pain. Further, I will discuss unique challenges nanomedicine meets which can hinder future clinical translation and commercialization. Our lab takes earlier established approaches in wider pharmaceutical industry such as quality by design (QbD) and addapts them to the development and production fluorous colloids nanomedicine. Following these methods we are able to develop robust processes for scale up, quality control and clinical translation. Recent results from these studies will also be presented. 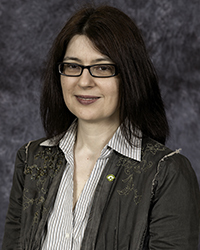 Dr. Jelena Janjic holds a pharmacy degree from Belgrade University, S.R. Yugoslavia and a PhD in Medicinal Chemistry/Pharmaceutical Sciences from University of Pittsburgh School of Pharmacy. She completed post-doctoral training at Scripps Florida in drug discovery and Carnegie Mellon University in imaging nanotechnology. She is full time faculty at Duquesne University Pharmacy School since 2009. Dr. Janjic is the Founder and have served as a Co-Director of Chronic Pain Research Consortium (CPRC, www.duq.edu/pain) at Duquesne University, since May 2011. CPRC, co-led with Dr. John A. Pollock, Co-Director generated to date more than 2.8 million dollars in external funding. She pioneered nanotechnology development for chronic pain and holds the first NIH award to date focused on theranostic pain nanomedicine designed to simultaneously image and modulate immune cells for therapeutic intervention in a number of inflammatory diseases. Her current nanotechnology work is funded by NIDA, NIBIB and DoD. For past ten years her focus was nanotechnology for imaging and drug delivery with two patents, more than 25 peer reviewed publications and book chapters, and invited presentations at national and international meetings. Dr. Janjic’s teaching is highly multidisciplinary covering topics in: pharmaceutical manufacturing, drug discovery and development, drug delivery systems, pharmacology of pain medicines, medicinal chemistry, human physiology and pathophysiology. She has strong interest in contemplative approaches to higher education. Since 2011 she teaches mindful living to students and faculty, leads workshops and practice sessions on contemplative life as an integral part of academic development. She is deeply engaged in the lab training graduate and undergraduate students and in her free time plays piano and composes music.